A “good clock” is recorded in the Terrier of 1777. There is no evidence of an early clock face but an old clock weight lay in Vale Cottage garden for many years and it was thought may have been part of an old free-standing clock used within the church in previous years. The present clock was dedicated in December 2000 and is located on the east wall of tower. 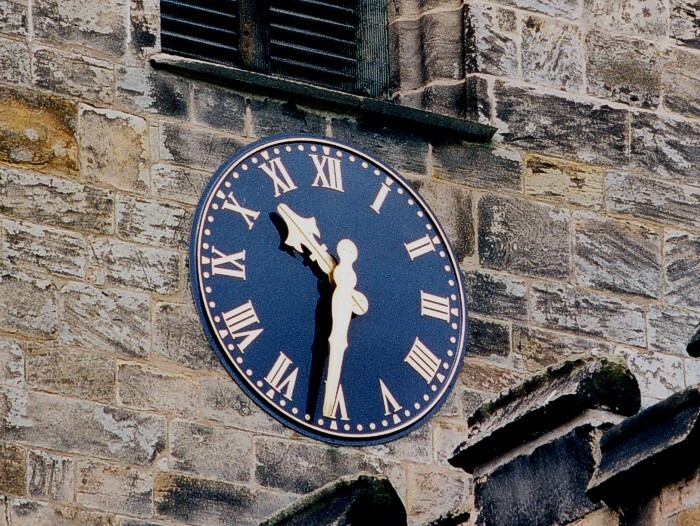 It has a 5-foot diameter face coloured blue (significant to the church’s dedication to St Mary the Virgin) with gold coloured fingers and Roman numerals. It shows a combination of traditional design and modern technology, with time-keeping in response to radio signals. The clock was created and installed by John Smith of Derby at a cost of £3,000, funded by the legacy of Percy Barsby.